So here’s today’s pub quiz question: which tech company performed overall better than any other technology firm in 2012? The chances are you might say Apple or Google. After all, Apple had by far the highest net income in 2012 in spite of today’s excellent results from Google. You might be tempted to answer the question with Facebook or perhaps take a punt on Groupon – yet both of those had dismal stock market performances, wiping large amounts off their valuation. For a company to be doing well its net income has to be good – preferably better than last year’s – plus its actual value should increase, as reflected in share price. So which company had both of those in 2012? The answer is a business which only has 200m users – absolutely tiny compared to the more than 1bn on Facebook or similar amounts that use Google every day. Gosh more people even own an iPod than use this business. But the company – in spite of its comparative smallness in the technology sector – saw its stock market performance outshine the competition and its net revenues rise by the greatest percentage. The company is LinkedIn. So the second pub quiz question therefore is this: what is different about LinkedIn in comparison with other tech companies? The answer is that unlike Apple, or Google or Microsoft, the company is focused on one thing – business networking for jobs. Indeed, only recently the firm has started to strip out unnecessary parts of its website which take it away from that core – such as LinkedIn Answers. 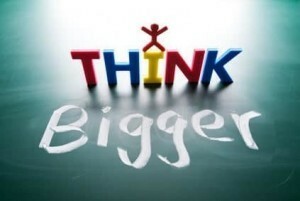 Many people who run big business seem to think that the answer to their survival and success is to get bigger. They focus on big numbers, big projects, big statistics. They grow by acquisition bringing in loosely connected services and products which “extend our offer”. Ultimately, all that does is confuse the staff and confuse the customers. LinkedIn – thus far – is bucking that trend. It is focusing, focusing and focusing. Sure, it will lose people who would like it to provide more services, but those who remain will be the core customers who rely on the company and will help it generate even more income. It is a lesson for us all. Diversification is a mantra from big business – and frequently it fails to deliver what the directors hope for. Often it leads to problems. Focusing on core products and services and your niche customers is the way to success – which the latest statistics on tech companies shows. Bigger is not always better.